David Brown is a former member of the City Council who served from June 2004 to December 2011. He served as Mayor of Charlottesville upon taking his Council seat, and was re-elected in November 2007. A native of Virginia’s Eastern Shore, David Brown received a BA in History from the University of Virginia in 1977. He graduated from Western States Chiropractic College in 1981, and returned to Charlottesville in 1982. 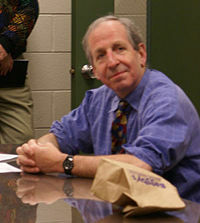 He is member of the Sportsmedicine Advisory Committee of the Virginia High School League, and served on the Virginia Board of Medicine from 1989 – 1997. He is a past President of Offender Aid and Restoration of Charlottesville, and directed the SOCA Outreach program from 2000 – 2003. He was elected to City Council in 2004, and served as Mayor through 2007. Brown is married to Jean Hiatt and had two sons. ↑ McNeill, Brian. "Local Supercar Races toward Multi-million-dollar Prize | Daily Progress." Home | Daily Progress. 20 July 2010. Web. 21 July 2010. <http://www2.dailyprogress.com/news/2010/jul/20/local-supercar-races-toward-multi-million-dollar-p-ar-321688/>.